(1) Introduction: (a) i. 1-ii. 5, a general view of the conquest of Canaan. The story is evidently intended to portray the great tribulations of the time of the Judges, which God inflicted because the Israelites partially spared the Canaanites in spite of His command to the contrary (see ii. 1-5, especially verse 3). (b) ii. 6-iii. 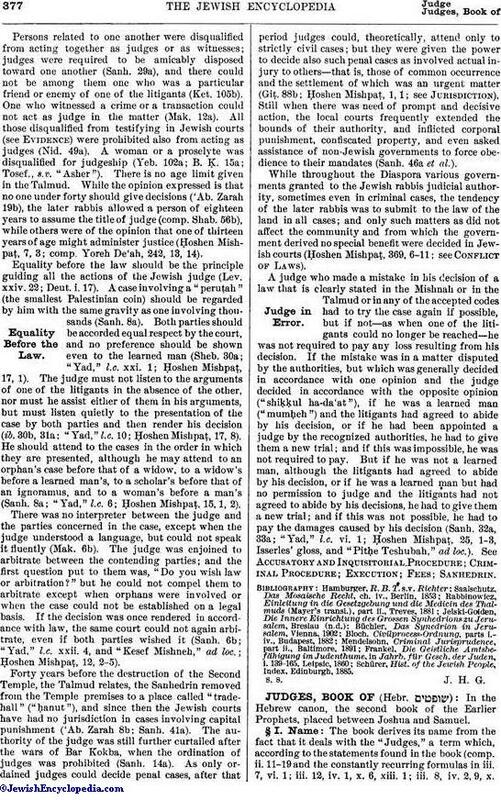 6, a general description of the conditions obtaining at the time of the Judges. The chief characteristic of this time is found in the recurring change from apostasy and punishment to repentance and deliverance. The account forms the introduction to the following stories, which are, as it were, summarized in ii. 11-19. (2) The Book of Judges Proper, iii. 7-xvi. 31: This describes Israel's delivery, through divinely appointed judges, from the subjugation to the Canaanites and the neighboring peoples which it had brought upon itself. The accounts of the activities of the several judges vary considerably in length; only the five so-called "Great Judges" are treated in detail. The narratives may be summarized as follows: (a) iii. 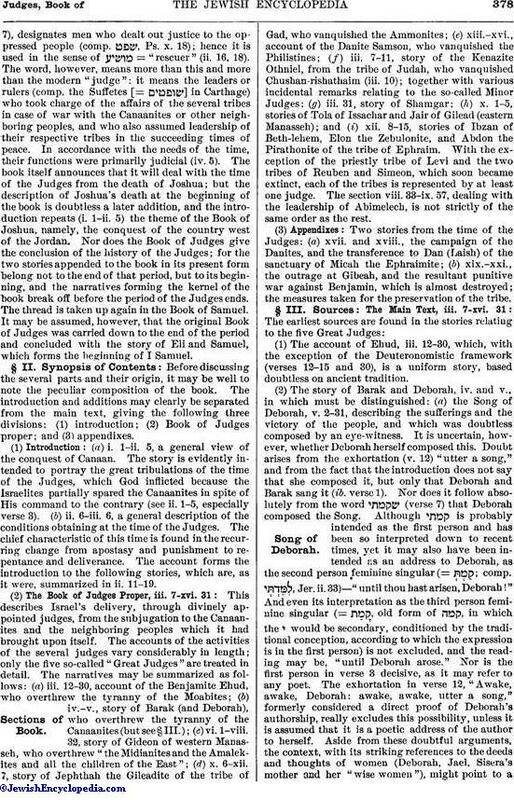 12-30, account of the Benjamite Ehud, who overthrew the tyranny of the Moabites; (b) iv.-v., story of Barak (and Deborah), who overthrew the tyranny of the Canaanites (but see § III. ); (c) vi. 1-viii. 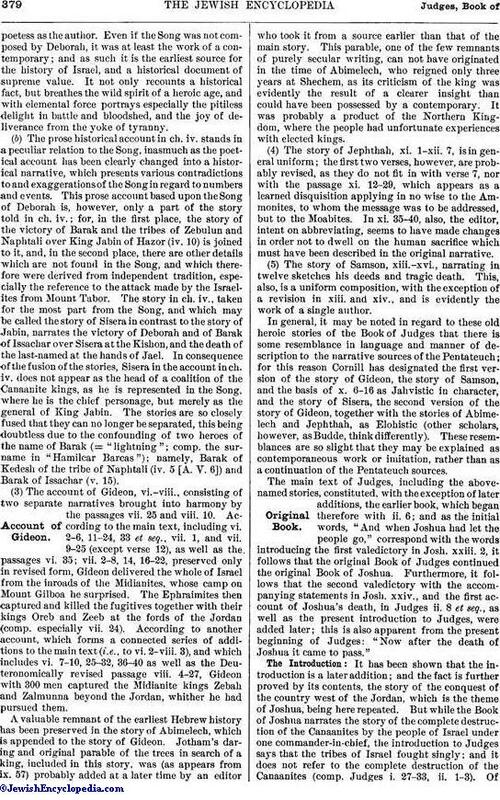 32, story of Gideon of western Manasseh, who overthrew "the Midianites and the Amalekites and all the children of the East"; (d) x. 6-xii. 7, story of Jephthah the Gileadite of the tribe of Gad, who vanquished the Ammonites; (e) xiii.-xvi., account of the Danite Samson, who vanquished the Philistines; (f) iii. 7-11, story of the Kenazite Othniel, from the tribe of Judah, who vanquished Chushan-rishathaim (iii. 10); together with various incidental remarks relating to the so-called Minor Judges: (g) iii. 31, story of Shamgar; (h) x. 1-5, stories of Tola of Issachar and Jair of Gilead (eastern Manasseh); and (i) xii. 8-15, stories of Ibzan of Beth-lehem, Elon the Zebulonite, and Abdon the Pirathonite of the tribe of Ephraim. With the exception of the priestly tribe of Levi and the two tribes of Reuben and Simeon, which soon became extinct, each of the tribes is represented by at least one judge. The section viii. 33-ix. 57, dealing with the leadership of Abimelech, is not strictly of the same order as the rest. (3) Appendixes: Two stories from the time of the Judges: (a) xvii. and xviii., the campaign of the Danites, and the transference to Dan (Laish) of the sanctuary of Micah the Ephraimite; (b) xix.-xxi., the outrage at Gibeah, and the resultant punitive war against Benjamin, which is almost destroyed; the measures taken for the preservation of the tribe. (2) The story of Barak and Deborah, iv. and v., in which must be distinguished: (a) the Song of Deborah, v. 2-31, describing the sufferings and the victory of the people, and which was doubtless composed by an eye-witness. It is uncertain, however, whether Deborah herself composed this. Doubt arises from the exhortation (v. 12) "utter a song," and from the fact that the introduction does not say that she composed it, but only that Deborah and Barak sang it (ib. verse 1). Nor does it follow absolutely from the word (verse 7) that Deborah composed the Song. Although is probably intended as the first person and has been so interpreted down to recent times, yet it may also have been intended as an address to Deborah, as the second person feminine singular (= ; comp. , Jer. ii. 33)—"until thou hast arisen, Deborah!" And even its interpretation as the third person feminine singular (= , old form of , in which the י would be secondary, conditioned by the traditional conception, according to which the expression is in the first person) is not excluded, and the reading may be, "until Deborah arose." Nor is the first person in verse 3 decisive, as it may refer to any poet. The exhortation in verse 12, "Awake, awake, Deborah: awake, awake, utter a song," formerly considered a direct proof of Deborah's authorship, really excludes this possibility, unless it is assumed that it is a poetic address of the author to herself. Aside from these doubtful arguments, the context, with its striking references to the deeds and thoughts of women (Deborah, Jael, Sisera's mother and her "wise women"), might point to apoetess as the author. Even if the Song was not composed by Deborah, it was at least the work of a contemporary; and as such it is the earliest source for the history of Israel, and a historical document of supreme value. It not only recounts a historical fact, but breathes the wild spirit of a heroic age, and with elemental force portrays especially the pitiless delight in battle and bloodshed, and the joy of deliverance from the yoke of tyranny. (b) The prose historical account in ch. iv. stands in a peculiar relation to the Song, inasmuch as the poetical account has been clearly changed into a historical narrative, which presents various contradictions to and exaggerations of the Song in regard to numbers and events. This prose account based upon the Song of Deborah is, however, only a part of the story told in ch. iv. ; for, in the first place, the story of the victory of Barak and the tribes of Zebulun and Naphtali over King Jabin of Hazor (iv. 10) is joined to it, and, in the second place, there are other details which are not found in the Song, and which therefore were derived from independent tradition, especially the reference to the attack made by the Israelites from Mount Tabor. The story in ch. iv., taken for the most part from the Song, and which may be called the story of Sisera in contrast to the story of Jabin, narrates the victory of Deborah and of Barak of Issachar over Sisera at the Kishon, and the death of the last-named at the hands of Jael. In consequence of the fusion of the stories, Sisera in the account in ch. iv. does not appear as the head of a coalition of the Canaanite kings, as he is represented in the Song, where he is the chief personage, but merely as the general of King Jabin. The stories are so closely fused that they can no longer be separated, this being doubtless due to the confounding of two heroes of the name of Barak (= "lightning"; comp. the surname in "Hamilcar Barcas"); namely, Barak of Kedesh of the tribe of Naphtali (iv. 5 [A. V. 6]) and Barak of Issachar (v. 15). (3) The account of Gideon, vi.-viii., consisting of two separate narratives brought into harmony by the passages vii. 25 and viii. 10. According to the main text, including vi. 2-6, 11-24, 33 et seq., vii. 1, and vii. 9-25 (except verse 12), as well as the passages vi. 35; vii. 2-8, 14, 16-22, preserved only in revised form, Gideon delivered the whole of Israel from the inroads of the Midianites, whose camp on Mount Gilboa he surprised. The Ephraimites then captured and killed the fugitives together with their kings Oreb and Zeeb at the fords of the Jordan (comp. especially vii. 24). According to another account, which forms a connected series of additions to the main text (i.e., to vi. 2-viii. 3), and which includes vi. 7-10, 25-32, 36-40 as well as the Deuteronomically revised passage viii. 4-27, Gideon with 300 men captured the Midianite kings Zebah and Zalmunna beyond the Jordan, whither he had pursued them.A valuable remnant of the earliest Hebrew history has been preserved in the story of Abimelech, which is appended to the story of Gideon. Jotham's daring and original parable of the trees in search of a king, included in this story, was (as appears from ix. 57) probably added at a later time by an editor who took it from a source earlier than that of the main story. This parable, one of the few remnants of purely secular writing, can not have originated in the time of Abimelech, who reigned only three years at Shechem, as its criticism of the king was evidently the result of a clearer insight than could have been possessed by a contemporary. It was probably a product of the Northern Kingdom, where the people had unfortunate experiences with elected kings. (5) The story of Samson, xiii-xvi., narrating in twelve sketches his deeds and tragic death. This, also, is a uniform composition, with the exception of a revision in xiii. 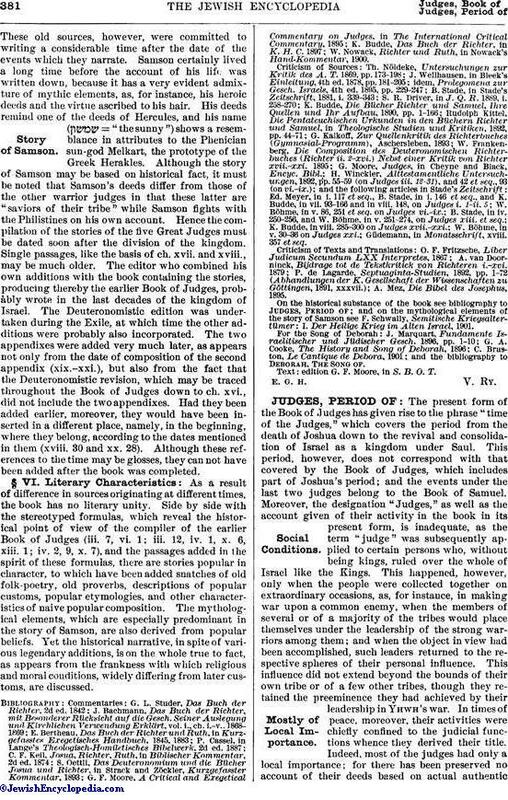 and xiv., and is evidently the work of a single author.In general, it may be noted in regard to these old heroic stories of the Book of Judges that there is some resemblance in language and manner of description to the narrative sources of the Pentateuch; for this reason Cornill has designated the first version of the story of Gideon, the story of Samson, and the basis of x. 6-16 as Jahvistic in character, and the story of Sisera, the second version of the story of Gideon, together with the stories of Abimelech and Jephthah, as Elohistic (other scholars, however, as Budde, think differently). These resemblances are so slight that they may be explained as contemporaneous work or imitation, rather than as a continuation of the Pentateuch sources. As two dates are given in the text, xviii. 30 and 31, the question arises which of these two statements is the original—that is, the earlier—one. The first statement, xviii. 30, points to the time of the fall of Ephraim (722 B.C. ), or at least to that of the deportation of the northern and eastern inhabitants of the country (735 B.C. ); the second, to a time near the beginning of the royal house of Israel, as the destruction of the Temple of Shiloh probably occurred during the Philistine wars, in which the priestly house of Eli, officiating at Shiloh, perished. 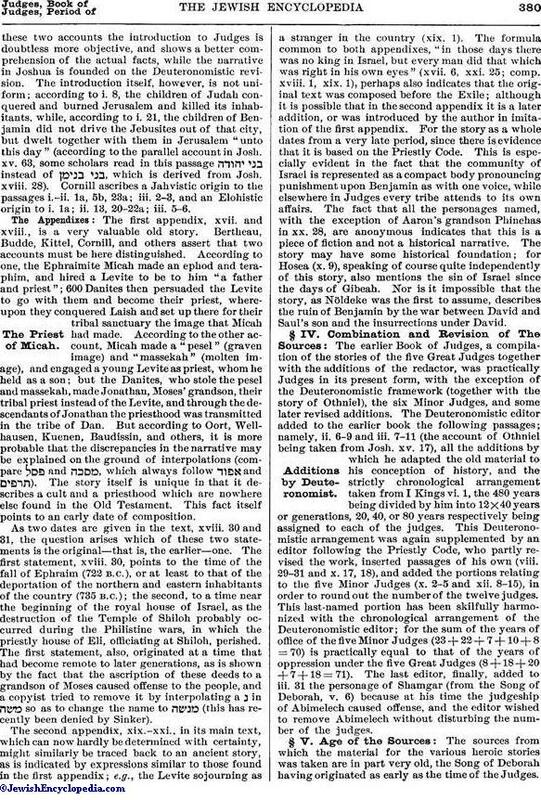 The first statement, also, originated at a time that had become remote to later generations, as is shown by the fact that the ascription of these deeds to a grandson of Moses caused offense to the people, and a copyist tried to remove it by interpolating a נ in so as to change the name to (this has recently been denied by Sinker). § IV. Combination and Revision of The Sources: Additions by Deuteronomist. § V. Age of the Sources: Story of Samson. W. Nowack, Richter und Ruth, in Nowack's Hand-Kommentar, 1900. Güdemann, in Monatsschrift, xviii. 357 et seq. A. Mez, Die Bibel des Josephus, 1895.
and on the mythological elements of the story of Samson see F. Schwally, Semitische Kriegsaltertümer: I. Der Heilige Krieg im Alten Israel, 1901.
and the bibliography to Deborah, The Song of. Text: edition G. F. Moore, in S. B. O. T.